To think an animal’s body part is worth its weight in gold is mind-blowing to say the least. 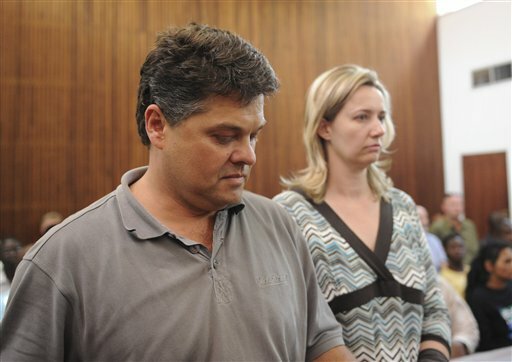 So how did this lucrative practice begin? 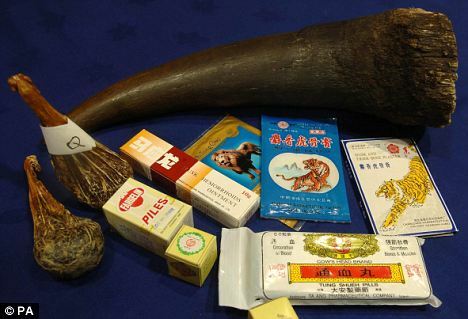 Who decided a rhinoceros horn is the key to solving all ailments? In Greek mythology, rhino horns were said to possess the ability to purify water. 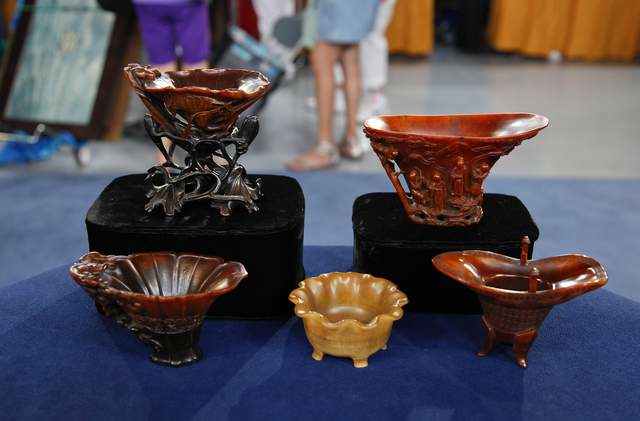 The Persians from the 5th century BC used carved vessels from horn to detect poisoned liquids. This belief stuck and existed well into the 18th and 19th centuries among European royalty. Between 100 BC and 200 AD during the Ming and Ching dynasties, the Chinese thought the same. They used the horn in carvings of plates, bowls and cups. The cups being especially prized to detect alkaloid poisoning, something that was treacherously common at the time. Reports of Yemens’ use of the horn dates back to the 8th century. Although their fondness of horn is preferred in decorative use as opposed to medicinal. 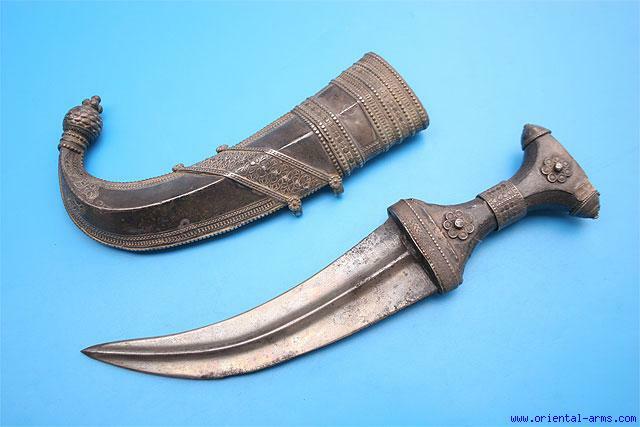 It is fashioned into ceremonial dagger handles known as jambiyas . This is a status symbol for young men. It epitomizes manhood. The quality of the horn was important because it possesses a translucent quality, that only improves with age. The use of the horn for medicinal purposes was recorded as early as 1597, in the Chinese “Pen Ts’ao Kang Mu”. 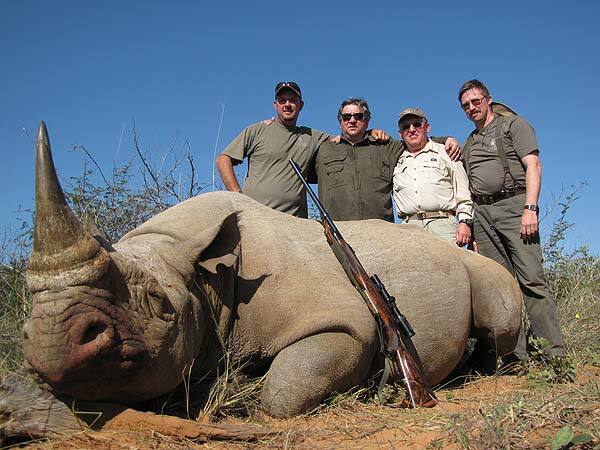 In it there are mentions such as “the best horn is from a freshly killed male” and “pregnant women should not take horn as it will kill the foetus”. It also lists the many uses of horn ranging from stopping nightmares and curing possessions to curing headaches and dissolving phlegm. In earlier time it was not just the horn, but also blood, and urine used for medicine. This was a commonality of the Chinese, Burmese, Thai, and Nepalis. In the early 1980s, it was even used as an aphrodisiac by the people of India. This myth probably stems from the fact that breeding pairs stay together for two to three days, and sometimes even weeks. Mating takes place several times a day and lasts for an hour or more at a time. 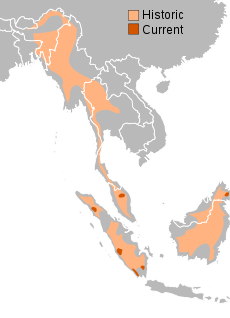 The earliest reports of horn trade (in addition to tortoise shell and ivory) were reported as leaving ancient East Africa for Arabia in 50 AD. Throughout the history of trade, various countries have been involved: Japan, Taiwan, Korea, Yemen, China, Hong Kong, Sumatra, Singapore, Thailand, Tanzania, Kenya and South Africa are the most prominent. Various efforts have been made in these countries to legalize and/or ban the trade as well. What is the most interesting point in the history of the horn trade is that during times horn could be legally traded, illegal trade still flourished. Thirty species of rhino once roamed the planet. Now thousands of years later, there remain just five. 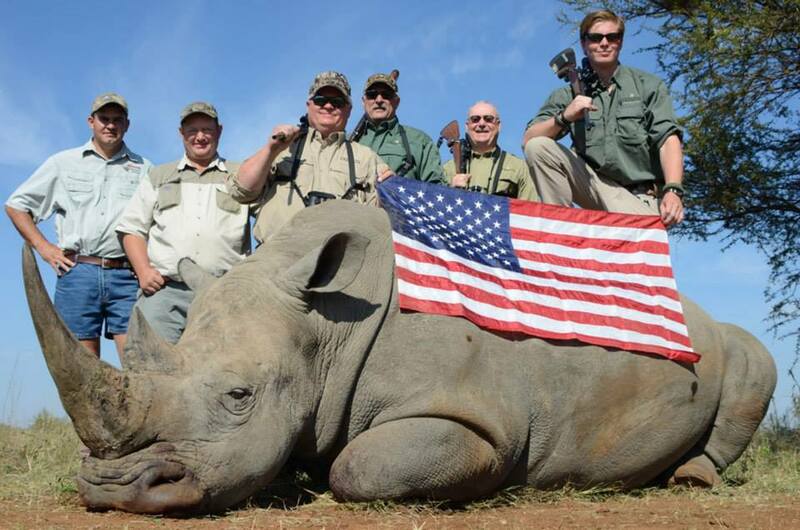 Human greed, consumption and ignorance have cost the rhino. They are teetering on the brink of extinction. Will history teach us nothing? 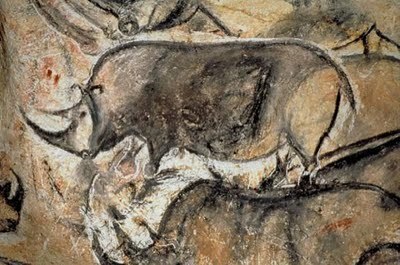 Chauvet cave, France- rhino cave painting dating back 30,000 BP (before present time recordings). 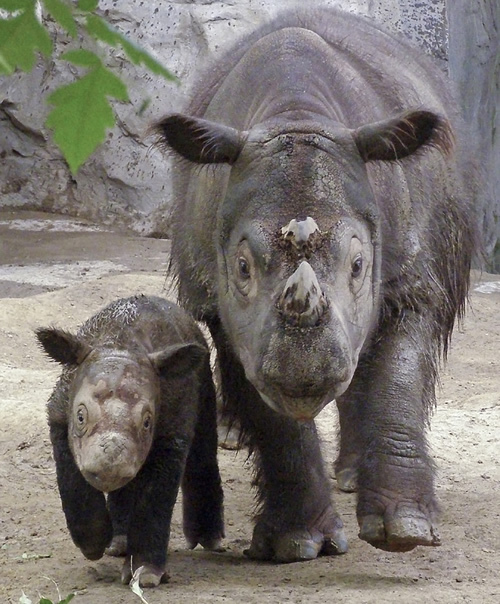 Andalas is not just any rhino dad. 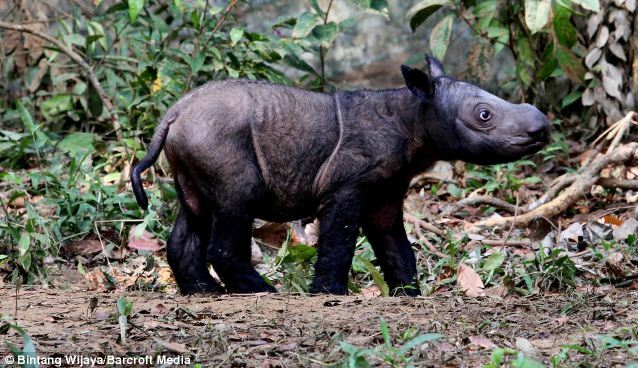 What makes him special is the fact he was the first Sumatran rhino born in captivity in 112 years! 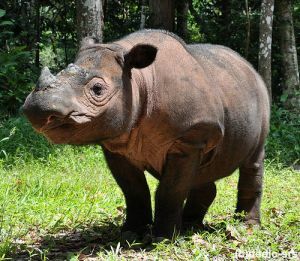 At 6 years of age he was moved to the Sumatran Rhino Sanctuary (SRS) in south Sumatra. His transition from zoo to jungle presented some challenges. He didn’t know how to wallow in mud holes, wasn’t used to browsing for his own food, or having such a variety of it. It took time for his caregivers to teach him these vital skills. He was also initially scared of other rhinos and ran when they came near. Not quite a lady’s man, he was overly aggressive to the females. After guidance and socialization skills from the staff, he was gradually introduced to two female rhinos. He chose Ratu. 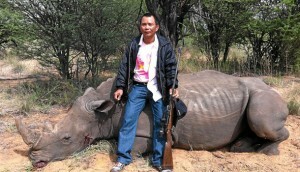 In 2012 he and Ratu became parents to Andatu, the first rhino ever born at SRS. It is hopeful he will be able to duplicate that success with other females. 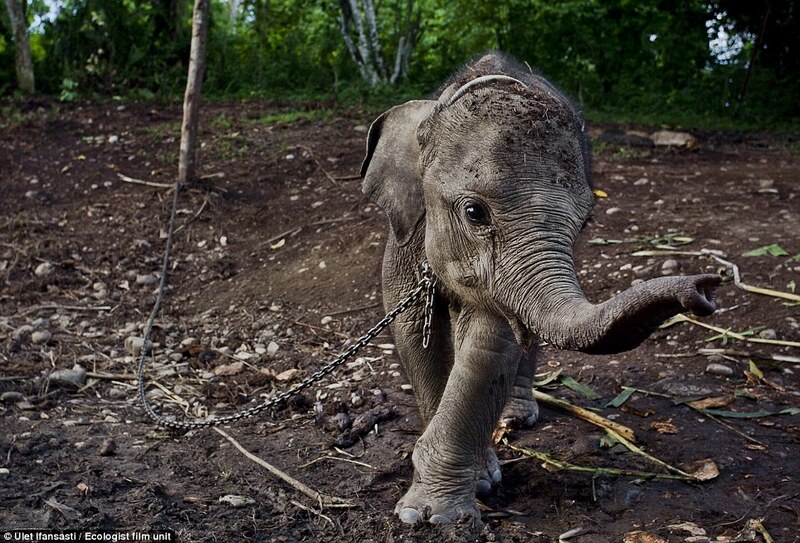 Straining against his chains, bellowing helplessly for his mother, baby Raja is held captive. He is alone, scared and hungry. The villagers in this Sumatran village are holding him for ransom. 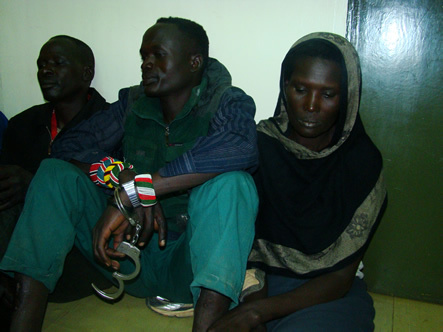 His crime: he and his family were searching for food in a deforested area, trespassing on the crops. In what is becoming an all too familiar scenario, demands are soaring for palm oil, more forests are being decimated for palm plantations, and the animals’ food and homes are destroyed leaving them displaced and desperate. Raja’s family, along with other homeless elephants were foraging for food, trying to survive. He was captured and brought into the village, held for weeks in an attempt to bargain with the government for compensation for their lost crops. One man went so far as to jump on the baby’s back in an attempt to”ride” him, saying the elephant should be trained to do tricks to “earn” his money back. Various groups tried to get veterinary care to the baby, and fought for his release but sadly Raja died. The stress and inadequate diet were too much for the little elephant. In the end, it’s not just a matter of saving the elephants (and the Tigers, Rhino and Orangutans in the forests of Asia), but also of saving the people. 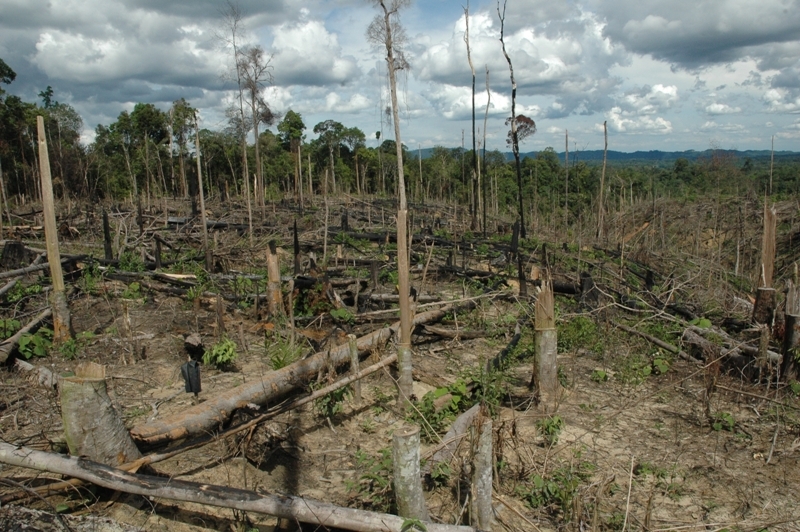 Deforestation has disastrous effects on the soil, the climate and ultimately the villages. PLEASE BE AWARE AND RESPONSIBLE! Palm oil is used in 50% of consumer products, but is NOT a necessary ingredient. Your ice-cream, margarine, shampoo, lipstick, and some breakfast cereals all contain palm oil. Please read labels and avoid palm products. For more information on palm oil or other names it goes by please go to : Say No to Palm Oil or the previous post There’s Orangutan Blood in my Kitchen. Emi the Sumatran rhino was the heart of the world’s only successful captive breeding program for the critically endangered species. 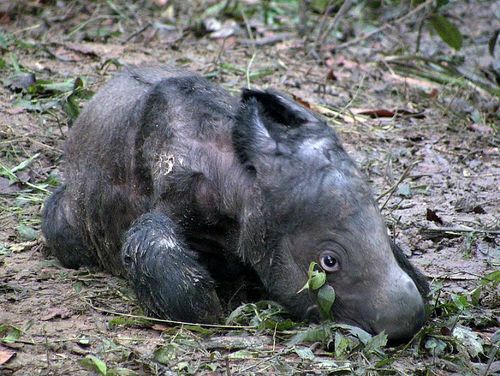 Andalas was released to the Sumatran Rhino Sanctuary (SRS) in Way Kambas National Park, south Sumatra. 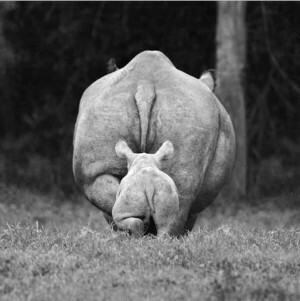 He successfully bred with another rhino (Ratu) and in 2012 they had a baby, making Emi a grandma! The baby, Andatu was the first successful birth in captivity on the island of Sumatra. Emi’s daughter Suci remains at the Cincinnati Zoo and Harapan is living at the Los Angeles Zoo. Unfortunately in 2009, Emi passed away in her sleep at the age of 21 (the typical lifespan of a Sumatran rhino is 35 – 40 years.) Known as a docile and amiable animal, she was one of the most beloved animals of the zoo. 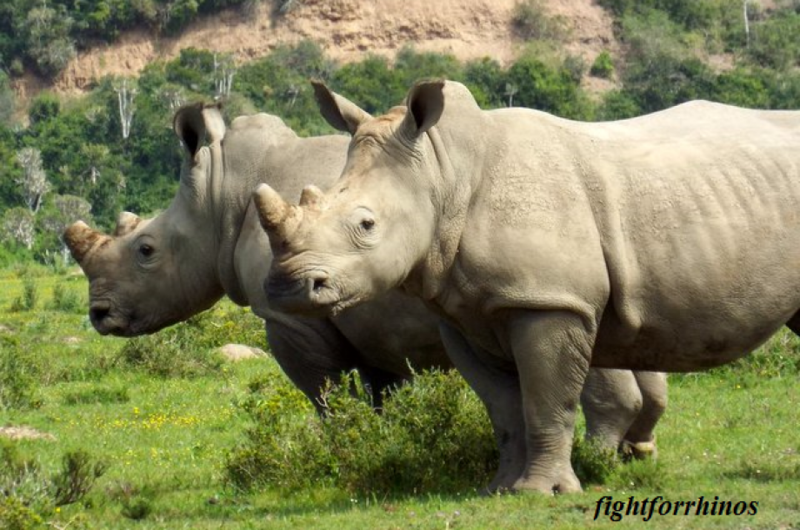 This amazing rhino unknowingly played a crucial role in saving her species and teaching conservationists how to help. On a personal note, Emi is the reason I fell in love with rhinos. She’s an inspiration.